This page contains news and information about roads and highways in Fulton County, Kentucky. Kentucky Atlas and Gazetteer: Fulton County - Basic geographic and demographic information about the county. Kentucky Transportation Cabinet: District 1 - Based in Paducah, District One serves the twelve westernmost counties. 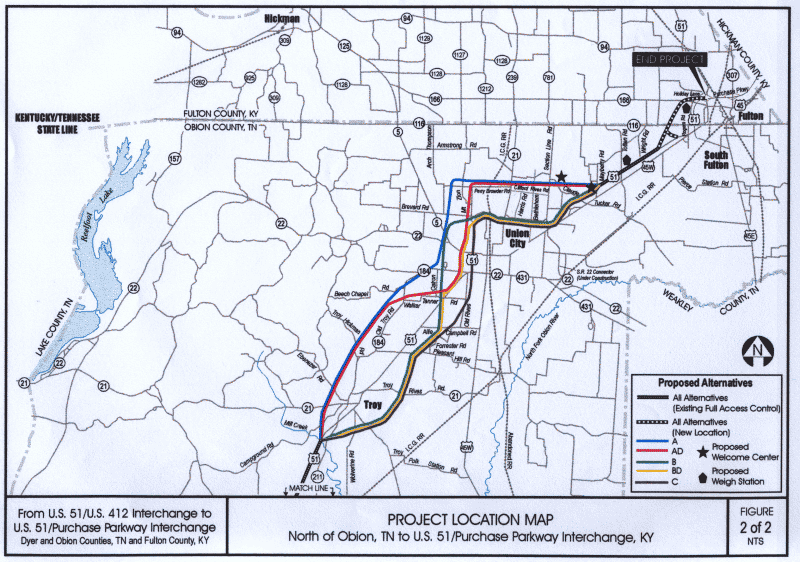 Kentucky Transportation Cabinet: District 1 Planning Projects - Reports and maps from the Division of Planning concerning projects in district 1. Kentucky Transportation Cabinet: Scheduled Public Meetings: District 1 - Schedule of any upcoming public meetings in Fulton County. HICKMAN, KY (January 27, 2010) – The Dorena-Hickman Ferry is closed due to high water on the Mississippi River. The ferry halted operations about 11:00 a.m., today, when floodwaters interfered with docking and loading of vehicles at the Kentucky landing. AP: Debate Grows over Impact of I-69 in Western Ky., Tenn.
Chris Lawrence has posted this summary of a recent road trip during which he attended a public meeting on I-69. His website on the Memphis-Evansville section of I-69 contains a description of where I-69 may be routed and this map of possible routes for I-69 near Fulton, Kentucky and Troy, Tennessee.